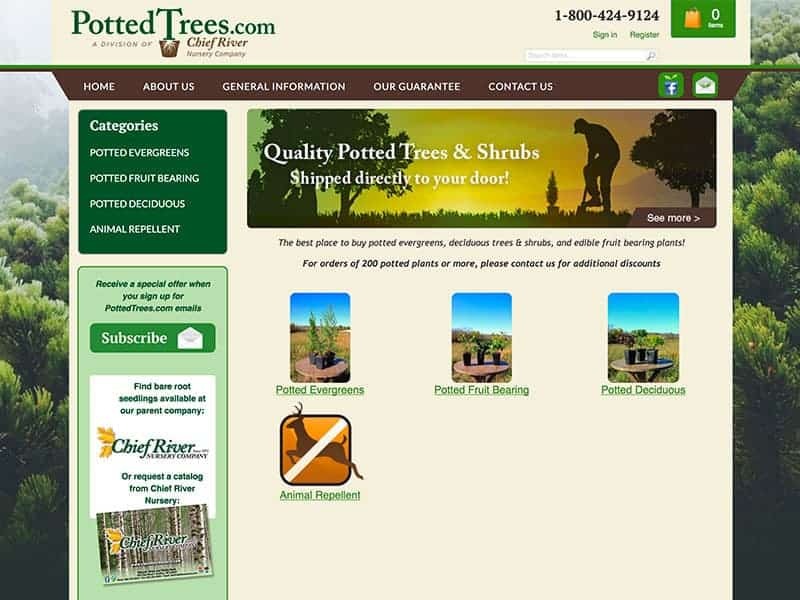 A natural extension of Chief River Nursery, Potted Trees was developed to serve as an online resource for all potted tree and shrub needs. Potted trees give you the advantage of being able to plant your trees throughout the year. You’ll find a very nice variety of trees – evergreens, deciduous and fruit bearing trees. It was a pleasure to work with Dean again to help develop his new e-commerce store. Our designers started with the development of a new logo. From there the colors were carried through to the online store. Our programmers worked closely with Dean to make sure the checkout process worked correctly for his unique product. The online store is built to grow along with his business. Adding new products and making updates are easy to do. Expand your businesses geographic reach. Contact us today!